The true story of middleweight champion boxer Jake LaMotta, Raging Bull chronicles a life that passes through boxing's glory and agony. Single-minded ambition combined with a dense self-centred personality and an inability to connect with anyone except at the business end of a fist ensured that LaMotta experienced the highs and the lows with equal intensity. Raging Bull is also a career highlight for Robert De Niro and director Martin Scorsese. We meet Jake (De Niro) as a young fighter in the early 1940's, as he slowly makes a name for himself in low-level bouts. 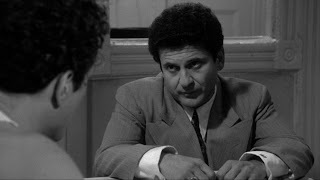 From a poor Bronx background, Jake has a short temper and suspicious personality that allows him to easily abuse his first wife and maintain only an edgy relationship with his loyal brother Joey (Joe Pesci). Jake has a thunderous punch and the ability to survive terrible beatings without being knocked-down. His reputation rises with a series of victories, and his personal life seems to take a turn for the better when he courts and marries Vickie (Cathy Moriarty), a young beauty from the neighbourhood. Jake believes that he is good enough to earn a title fight, and has the ambition to match his uncompromising fighting style. Never knocked down but with a mixed record, he takes on Sugar Ray Robinson in a series of fights that enhance his standing in the boxing world. Despite blatantly throwing a fight to appease local crime lords, he eventually becomes world middleweight champion. But even at the top of the world Jake's insane jealousy means that he can trust no one, least of all Vickie and Joey. From the heights of success he has a long way to fall, as his personal life collapses and his career ends with mounting weight problems. He opens and operates a nightclub, but this lands him in jail after he unwittingly allows young girls to prostitute themselves out of his establishment. The story ends in 1964, with Jake establishing a niche for himself as an after-dinner entertainer. 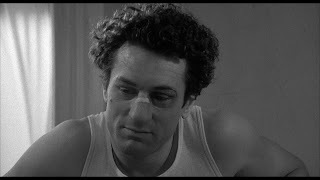 Scorsese directs Raging Bull in brilliant black and white and using almost exclusively mid-range and close-up shots, as he delves deeply and at close quarters into the life and emotions of LaMotta. The movie is about the thin line between the forces that govern spectacular success and stunning failure; and boxing as a perfect metaphor. LaMotta's combative power and determination took him to the top; his inability to relate to others except through the lens of confrontation ensured his undoing. Scorsese makes sure that his cameras are never far from any of the forces, and LaMotta's life is portrayed as equally brutal inside and outside the ring. The graphic scenes of boxing violence are brutally intense, the black and white cinematography enhancing the sweat, blood and agony of close quarters combat between men of monstrous willpower. De Niro gives one of the performances of his career, convincingly bringing LaMotta to life from a young man to a chastened but unremorseful fallen hero, capturing the right amount of drive and human failings without ever appearing to act. Filled with honest brooding intensity, the performance earned him the Academy Award as Best Actor for 1980. Opposite De Niro's LaMotta, Joey and Vickie are the only other major characters in the film. Joe Pesci became a leading character actor with his performance as Joey, and established the outline of the persona that he would perfect in GoodFellas ten years later, also alongside De Niro and Scorsese. Cathy Moriarty's debut as Vickie is memorable but unfortunately relatively statuesque. Raging Bull is a timeless classic, the story of man's sometimes desperate struggle to control the potent conflicting forces that lie within, and that can both construct and destroy destiny.